The Harvey Wallbanger, invented in 1952. Photo courtesy Vinepair. 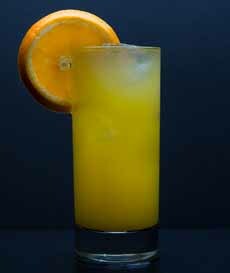 November 8th is National Harvey Wallbanger Day, a cocktail made with the Italian herbal liqueur Galliano (more formally, Liquore Galliano L’Autentico) plus vodka and orange juice (think Screwdriver with Galliano). 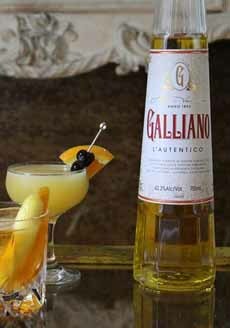 Galliano liqueur was created in 1896 and named after an Italian war hero, Giuseppe Galliano. It’s flavored with anise, cinnamon, coriander, ginger, juniper, lavender, musk yarrow, peppermint, star anise, and vanilla (the last ingredient being the most prominent, with a second note of anise. The vivid yellow color, chosen to acknowledge the California Gold Rushes of the period, is now made with a lemon-yellow die called tartrazine. But what about Harvey Wallbanger? According to legend, he was a Manhattan Beach surfer who patronized Duke’s Blackwatch Bar on Sunset Boulevard in Hollywood. Donato “Duke” Antone, a world champion mixologist, invented the Harvey Wallbanger in 1952. In a Collins glass or other tall glass filled with ice, mix the vodka and orange juice. Float Galliano on top and stir. The maraschino cherry was not part of the original recipe, but was added later for color. 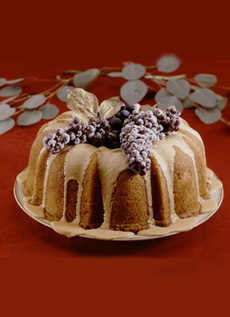 The ingredients of the Harvey Wallbanger can also be transformed into a Harvey Wallbanger Bundt Cake. Galliano liqueur. Here are more cocktail recipes from Food & Wine. Blanco or white Tequila is called “silver” Tequila by some producers. Preheat oven to 350°F. Butter and flour the inside of a bundt pan. Mix cake ingredients together. Pour into bundt pan and bake 45 to 50 minutes. Mix glaze ingredients. When cake is cool, pour glaze over cake. Serve with a liqueur glass of Galliano.